The H2MC Mic Clip Adapter from Zoom is a convenient adapter that allows you to place your H2 or H4 digital recorder on a standard microphone stand. Simply screw the adapter into the threaded mount on the recorder, and then slip the adapter into a microphone clip. Box Dimensions (LxWxH) 4.25 x 1.25 x 1.2"
H2MC - Mic Clip Adapter for H2 & H4 is rated 4.7 out of 5 by 26. Rated 4 out of 5 by Anonymous from Clip is much cooler than tripod I know the H4 has a tripod with it to hold it, but that seems to be a little weak. You have to find a table or put it on something nearby to set it on. With the clip, if you're at band practice, or doing some video shooting or even just recording SFX on the go, it can come in handy to have it sit on a mic stand rather than, lets say held in your hand, attached to your belt, on the floor where it will be stepped on, or too far away on a table. Screws right into the back of the holder that holds the H4. Nothing fancy but it does the job. There's not much threading on the end of the adapter, but I'm hoping that there would be no reason to apply alot of force and accidentally bend or break the end of it. Speaking of, it's durable enough. Rated 5 out of 5 by Anonymous from Champagne Results with a Beer Budget! Chamagne results on a beer budget would be the best way to describe this product. I already had two of these in my studio, and just purchased three more! This adapter will work with any camera (amateur or professional) that has the standard camera mount thread. This has made it possible to mount video cameras on mic stands in such a way that would not be possible with your typical camera tripod stands. For example, a standard microphone stand with a boom arm on it can have a camera mounted overhead to video yourself playing the piano - the resultant video shows all 88 keys and your fingers as you play - perfect for making piano tutorials! You're limited only by your imagination. This is one of the best purchases I've ever made! Rated 4 out of 5 by Anonymous from A little big I'm using it with a Zoom H4 Recorder, to mount it to a mic stand. It works, it basically fits into a standard mic clip -- although it's not in there quite as solidly as you'd expect a standard-sized microphone to be. Seems to be just a little wide for a solid, standard fit. But hey, for a few bucks it mounts my H4 to a mic stand. Done and done. Rated 4 out of 5 by James from A -must have- adapter I've been using these stand adapters since I bought my zoom h2 years ago, & it came included with the recorder. They are made of cheap plastic, but I've only had 1 of 6, so far, fail. I use these to setup all my video camera's, & digital field recorder's when recording concerts & clinics, mounting everything on tripod mic stands with booms. These are a must have for videographers, but I do wish they made them out of better material. Rated 4 out of 5 by Guygurt from works for multiple devices I do not own an H2 or H4, but this product fits perfectly into my Olympus LS-10. I think as long as you have a digital camera type screw hole, the device will fit. It's made of plastic, which I don't like, but I doubt there will be any problems in it breaking because of how simple and basic it is - A microphone sized stick with a screw on top. 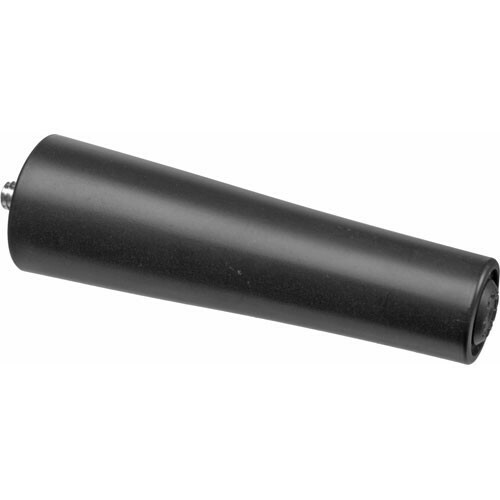 Rated 4 out of 5 by Anonymous from Great Adapter This adapter is super useful for recording in live sound situations. Just screw the handle into the back of the Zoom, clip it into a Mic stand, and your ready to go. I use it to record performances as well as making sound samples for music and film. The only con is that it's casted hollow so you need to take some care for your recorders sake.